Here comes the Stealth H-52. With your feet firmly on the pegs (not pedals!) and the throttle pinned, you're in for the ride of your life. The Stealth H-52 is more fighter jet than bike with its purpose-built cockpit primed and ready for launch. Twisting the throttle is like hitting the afterburner as pure, electromagnetic thrust takes over and launches you into the stratosphere. So, we've already slip one secret of the Stealth H-52 out of the bag. What other tricks do you need to see to believe? This model utilises our highest rate lithium battery, featuring a peak power of 5.2kW. Climbing on board that H-52 you'll find the controls intuitive and comfortable keeping you in control of your flight path. Without the option of pedalling, the H-52's new 5.2kW BLDC motor and high performance lithium battery is your powerhouse. The sound of the wind and the tyres beneath you is all you hear as you accelerate to speeds of over 80km/h in virtual silence. Capable of covering up to 60km on a single charge, the H-52 will smoke anything in its class on tight single track or tight, all terrain courses. The environment is at the mercy of your power. Forget lubing your chain, the H-52 simply doesn't have one. 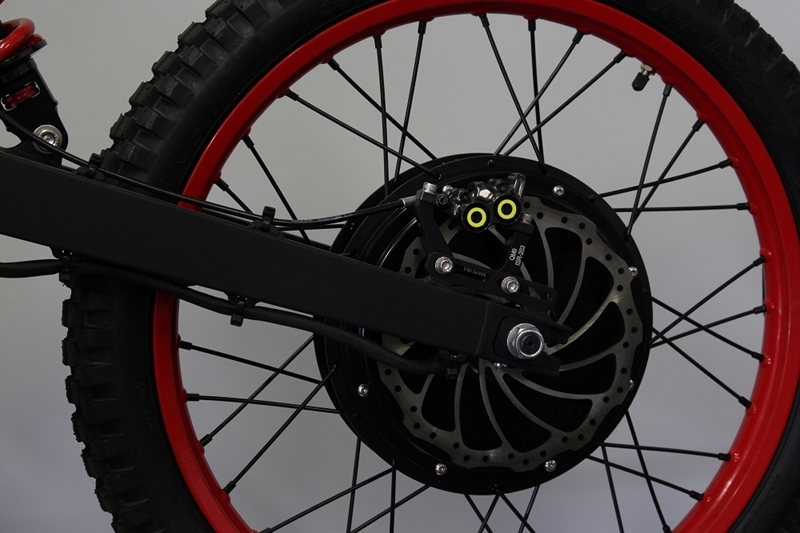 Boosted by its high torque DC motor, the genius of this bike is in its simplicity. There's only one moving part transmitting power to the ground making maintenance is a breeze. A bike, but like no other. Forget oil changes, air filters, slipping clutches and worn sprockets, on the H-52 these parts don't exist allowing you to spend less time on the sidelines and more time in the cockpit. It's a win/win! Whether you're pulling up to a stop, or coasting down hills, the red button near your left-hand grip activates an industry-leading Regen braking system. Harvesting power from braking to further extend your range. The more you go downhill, the more you can cruise back up. There's plenty more to like about the H-52. But actions speak louder than words. So grab your helmet and gloves and give Stealth a call. Book a test ride today and find out what the H-52 hype is all about!